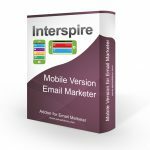 In March of 2015 we released a plugin or extension for WooCommerce for all of our friends that use Interspire Email Marketer. 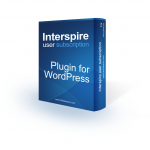 Our first plugin, WordPress User Subscription, allows you to subscribe contacts to a contact list based on their user type in WordPress. 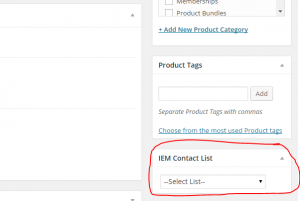 This new WooCommerce plugin, allows you to subscribe users to specific contact lists based on what product they purchased from your WooCommerce store. 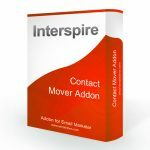 When installed and activated this plugin will add a new menu item to the sidebar of your product screen that gives you the option to select any of your contact lists from Interspire Email Marketer. When a new customer purchases that product their first and last name will be added to that contact list along with their email address. 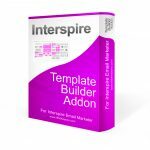 This empowers you as a savvy marketer to setup autoresponder series for customers of specific products. This can help you upsell or cross sell other products based on the customer’s interests and also makes it easy to send out updates or new releases for your digital products that you sell via WooCommerce. 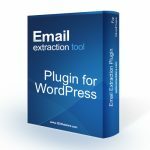 We recommend to our customers that you use both of our WordPress plugins together. 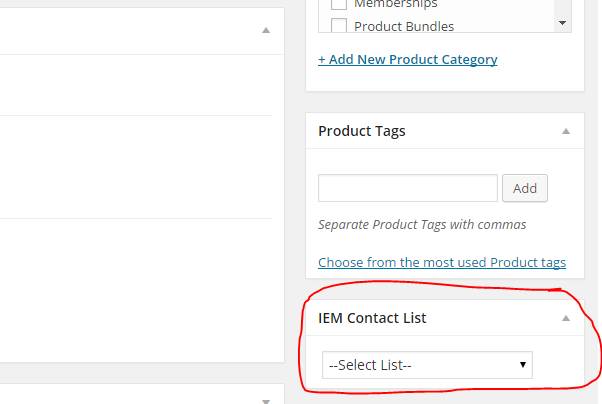 Our User Subscription plugin should be configured to add all customers to a master list and then the WooCommerce IEM plugin to add customers to lists based on their product purchases.